Despite soft economic outlook, the company should be able to generate higher sales in due to the sustainable demand for its diabetes products, disease testing products, and cell analysis products. The company generates over half of its sales from international operations, which is expected to increase as it grows its presence in emerging markets. The company is also active on the acquisition front as well as in investing heavily in research and development (R&D). Currently Becton Dickinson is attractively valued at 13.30 times earnings, has a sustainable dividend payout and yields 2.40%. I would consider initiating a position in the stock on dips below $72. The technology sector has typically been characterized by rapid product obsolescence and the tremendous amounts of capital necessary to invest in Research and development, in order to maintain the competitive edge. The positive sides of technology include that a simple idea such as a piece of software can be widely distributed for a nominal cost, once the product is finished. The fact that companies have to come up with new innovative products all the time, since the status quo of the existing ones is challenged all the time, has historically lead to volatility in earnings. With such volatility, most companies have had to reinvest most of their earnings back into the business. This has not resulted in future growth however, as some firms ended up betting everything on themselves, while their industry niche was going into extinction. In addition, the most successfully technology companies have been able to continuously predict and capitalize on future trends. Given the fact that the technologies ten years from now will be different that the technologies from today, a bet on tech stocks seems more like a speculation, rather than an investment. Because of the factors listed above, few tech companies have a wide moat. Most, such as Google, Microsoft, Intel or Apple have a moat, which could last for a few years. But that is until there is some ground breaking technology change or disruption, which provides consumers with a better, slicker and more advanced piece of technology. Companies such as International Business Machines (IBM), which has successfully been able to adapt for decades are the exception, rather than the norm. Vodafone Group Public Limited Company (VOD) provides mobile telecommunication services worldwide. It offers mobile voice services to approximately 370 million customers; messaging services; mobile data services; fixed broadband services to approximately 6 million customers; and whole sale carrier services to approximately 40 African countries. This international dividend achiever yields 7.70%. I am not a big fan of technology in general for my dividend portfolio. As a result, I am mostly underweight the sector. While I might miss out on some spectacular stories such as Apple (AAPL), the lack of wide moats make it difficult to commit a large portion of my portfolio to the sector. In addition, the low number of dividend achievers and aristocrats in the technology sector epitomizes the fickle nature of technology as a business in general. In the world of dividend investing, there is always a trade-off between dividend yield and dividend growth. Companies that typically spot above average yields, tend to increase distributions very slowly. Corporations which manage to increase distributions very quickly, typically tend to pay a low current yield. I believe that there is a place for both strategies in a dividend growth investor's portfolio. The high yielders provide a steady stream of distribution income today, which will likely have a hard time keeping up with inflation. The high dividend growth stocks pay low yields today, but provide a great opportunity for high yields on cost in the future coupled with strong potential for capital gains. When investing for income, many retirees focus on the dividend stream. Living off dividends in retirement is helpful in creating a consistent stream of income, which does not fluctuate as wildly as stock prices do. Focusing only on the distributions however, without giving much thought to anything beyond the juicy current yield could be dangerous. Dividend investing is a process with several stages, in order to minimize risk of income reduction in retirement. The first stage should be selecting quality income candidates from a pool of securities which have certain characteristics that the dividend investor is looking for. For example, I tend to purchase companies which have consistently raised dividends for at least ten years in a row. As a result, I start my screen with the list of Dividend Achievers. The second stage should be applying a set of entry criteria to the list of qualified candidates, in order to narrow it down to a more manageable list for further research. This set of criteria should reflect important points of the investor’s strategy, determined based off their experience in the markets and risk tolerance. The next stage should be analyzing each security in detail. Given the wealth of data on the internet these days, many investors tend to focus on the quantitative side of analysis. While it is helpful to see the trends behind the data and it is fun to project past results, investors should not stop there. Evaluating qualitative characteristics such as branding, product mix, competitive advantages, strengths, weaknesses, opportunities, trends and industry factors should be an important part of the analysis toolset. Obtaining an understanding of the business by reading annual reports or research reports and news stories as well as observing the business operations in person would also add to the investment evaluation of the business. While creating a diversified income stream is important, investors should also not forget about capital gains either. It is important to understand where the distributions are being derived from. There have been certain investments where investors have receiving a large portion of the distribution as a return of capital, rather than income. While the cashflow was high enogh to lure investors into the high yielding investment, the security was paying these distributions on a borrowed time. Once the capital base is depleted, investors would end up with no income and their security might be worthless. One such security are US oil and gas royalty trusts. Most of these pass-through entities tend to pay high current distributions every month out of their royalty interests in Oil and Gas fields. As these fields get depleted however, there comes a time when there would be no longer any revenues and thus no profits to distribute to shareholders. A larger portion of the current distributions of these businesses represents a return of capital, which is logical given the fact that for every barrel of oil equivalents pumped out of the ground, there is one less barrel to be pumped in the future. Once all the barrels in the reserve have been depleted, there will be no more oil to be produced and sold. Examples include BP Prudhoe Bay Royalty Trust (BPT), Hugoton Royalty Trust (HGT)and San Juan Basin Royalty Trust (SJT). Dividends typically account for 40% of annual total stock market returns. The remaining 60% come from capital gains. It is also important to not forget about capital gains because they ensure that over time your principal investment maintains and even grows its purchasing power over time. That is why selecting companies which have future prospects for growth is so important. Some of America’s richest families, own stakes in one of the oldest enterprises. The Rockefellers, Waltons, DuPonts, Johnson’s, Mellon’s control fortunes in the billions of dollars, which are spread amongst descendents of the people that accumulated the fortunes. These families have had generations of trust fund babies, which are essentially people who are expected to be retired for the rest of their lives. One common characteristic between all of these families, is that their wealth is stores in companies, which tend to pay consistently increasing dividends. The Waltons have Wal-Mart Stores (WMT), the Rockefeller's have Exxon-Mobil (XOM), the Johnsons have Johnson & Johnson (JNJ) while the Stryker Family has Stryker (SYK). The rising dividend payments generated by the companies these families own, generate the sufficient stream of income, to pay for the monthly expenses of generations of descendants. These families have essentially managed to live off dividends for decades. Investors, who are interested in generating an income stream off their capital, that would last for several generations, should look no further than dividend growth stocks. As far as the Stryker Family is concerned, their core holding announced an 18% increase in dividend income over the past week. International Business Machines Corporation (IBM) provides information technology (IT) products and services worldwide. This dividend achiever has paid uninterrupted dividends on its common stock since 1913 and increased payments to common shareholders every year for 16 consecutive years. Most recently, billionaire investor Warren Buffett made public his 5% stake in IBM, along with his stakes in several new companies. 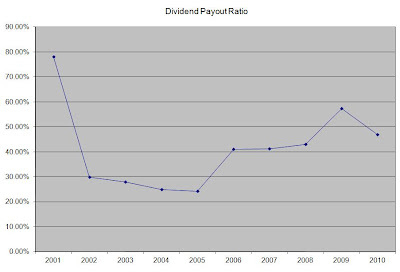 The most recent dividend increase was in May 2011, when the Board of Directors approved a 15.40% increase in the quarterly dividend to 75 cents/share. IBM’s largest competitors include Infosys (INFY), Wipro (WIT) and Accenture (ACN). The company has managed to deliver a 11.60% annual increase in EPS since 2001. 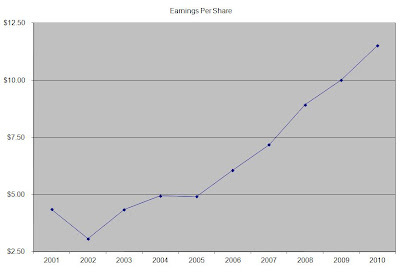 Analysts expect IBM to earn $13.36 per share in 2011 and $14.79 per share in 2012. In comparison IBM earned $11.52 /share in 2010. IBM has publicly announced its goal to hit $20 in earnings per share by 2015. The company is one of the most consistent repurchasers of stock, having reduced the total shares outstanding by 50% since 1995. IBM has transformed itself from a hardware company to services, solutions and software conglomerate. The company’ expansion overseas, focus on high margin software and providing solutions to customers, investing in innovation should help it in achieving its goals. The company faces some pricing pressure from competitors, and risks related to failure to transition new products successfully. However, given the company’s economies of scale, contiguous focus on building and maintaining strong client relations and drive to innovate, it should weather any near term weaknesses successfully. 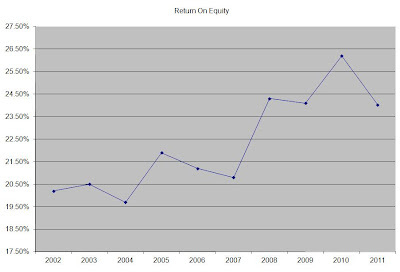 The company’s Return on Equty has doubled over the past decade. Rather than focus on absolute values for this indicator, I generally want to see at least a stable return on equity over time. The annual dividend payment has increased by 18.30% per year since 2001, which is higher than the growth in EPS. I would expect IBM to keep increasing in dividends at 10% per year at least for the foreseeable future. An 18% growth in distributions translates into the dividend payment doubling every four years. If we look at historical data, going as far back as 1993 we see that IBM has actually managed to double its dividend every four and a half years on average. The company did cut distributions by 80% in 1993. If the company diverts the money it uses for share buybacks, its dividend payment could have easily topped $14/share in 2010. The dividend payout ratio has remained low below 25% for the majority of the past decade. A lower payout is always a plus, since it leaves room for consistent dividend growth minimizing the impact of short-term fluctuations in earnings. Currently IBM is cheap at 15.30 times earnings, has a sustainable dividend payout but yields a paltry 1.60%. I would keep IBM on my radar, and would consider it for inclusion in my dividend growth portfolio on dips below $120/share, which is the equivalent of a 2.50% yield at current dividend rates. The Dividend Aristocrats index was created by Standard and Poor’s, to include companies in the S&P 500 which have increased dividends for at least 25 consecutive years. The types of companies included in the index are representative of several sectors, and thus the list is relatively well diversified. The stocks offer both capital appreciation potential as well as a growing dividend payment. Besides being a member of S&P 500 index, companies need to have a float of at least $3 billion, an average daily trading volume of $5 million and have increased distributions for at least 25 years in a row. Companies are deleted from the list, if they fail to increase or cut dividends in a given year. The only company, removed from the index includes CenturyLink (CTL). CenturyLink, Inc. (CTL), together with its subsidiaries, operates as an integrated communications company. The company has maintained its quarterly dividend at 72.50 cents/share for two years, which is why it is being kicked out of the index after raising distributions for 37 years in a row. While I initially considered the Dividend Aristocrat’s index the cream of the crop and the first stop in my dividend research, the volume and capitalization requirements have somewhat turned me off of the index. For example, companies which have managed to raise dividends for over a quarter of a century with a market capitalization of less than $3 billion and average daily volume of less than $5 million dollars would not be included. This is the reason why I prefer to use the Dividend Champions index instead. The only drawback of the Champions index is that the total returns are not calculated, whereas the total returns on the S&P Dividend Aristocrat’s index are. Every week, I review the list of dividend stocks, which announce dividend hikes. I tend to focus on the ones which have at least a five year record of consecutive dividend increases for future research. While I typically require at least ten years of consecutive dividend increases before I initiate a position in a given stock, familiarizing myself with potential additions several years before I pull the trigger could be a real time saver. In other words, if I like the economics of a company such as Intel (INTC) today, and the only red flag is that it hasn’t raised dividends for 10 years in a row, I would be mentally prepared to act if it is still attractively priced in a few years.